Revisions are a normal part of the design process and while you may not be able to eliminate revisions, you can proactively manage the revision process to reduce the number of requests and protect your profit margin. If you’ve ever had this thought, you know that client services, while rewarding, can also be can be frustrating and exhausting. If you bend over backward to accommodate your client too much, you risk losing control of the project scope, setting a dangerous precedent with your client, and eroding your profit margins. On the other hand, if you refuse even the slightest extra request and stick to your contract with little to no flexibility, you risk damaging the client relationship and potentially losing the client. At my agency, Bourn Creative, we follow a firm, fair, and friendly approach to effectively manage projects and delicately manage clients so all stakeholders are happy. We are firm in our scope of work, deliverables, boundaries, and terms. This is a professional relationship, there are specific outcomes that must be met, and we take what we do very seriously. We are fair in our pricing, process, and structure. We want our client relationships to be mutually beneficial and provide value for everyone involved. Our goal is to deliver a quality product and an extraordinary experience for a fair fee. We are friendly in our approach. We use simple, clear, easy to understand language, align our actions with a desire to provide care, education, and support, and plan ahead to accommodate minor client requests so we can give a little extra. The goal of every service provider should be building strong, healthy, positive client relationships, and while most relationships begin that way, with both parties excited to get started, some client relationships quickly devolve during design revisions, leaving the client frustrated and the designer resentful. All problems that arise from design revisions can be attributed to a failure to properly set expectations, poor communications, or mismanagement of the client or project. 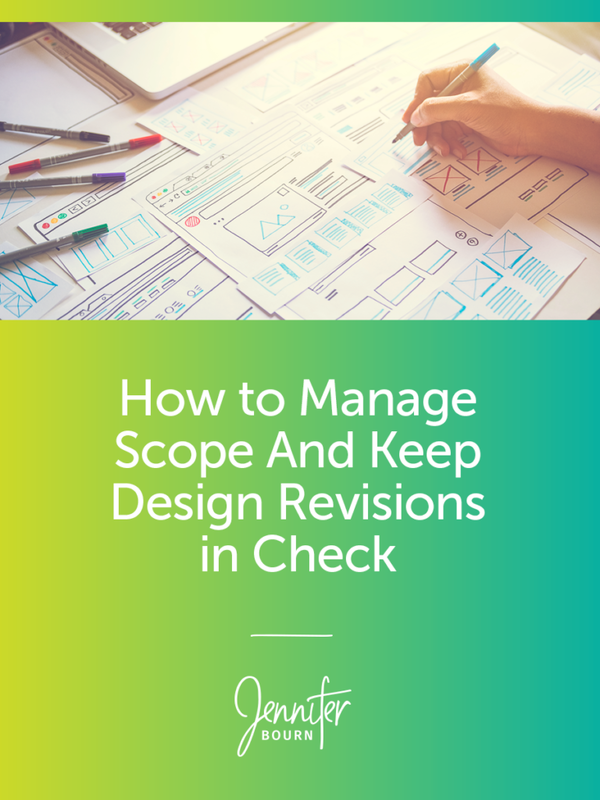 Revisions are a normal part of every design process, especially when designing for others, and while you may not be able to eliminate revisions, you can proactively manage the revision process to reduce the number of requests and protect your profit margin. While there is research, planning, and strategy guiding the design of the project so every element in the design has a purpose, design itself is still subjective. No matter how hard you work on a concept, the client will have opinions—they may not agree with your decision or like your work, and they may question your choices—and as your paying client, they have that right. You can’t take client feedback personally. Client input on design has nothing to do with you and everything to do with their own history, experiences, and preferences. Your job is to be the champion of the design, to keep the conversation focused on the goals of the project, and to gently remind the client that the design shouldn’t be about what they like personally, but what will resonate best with their audience. One of the primary things I cover in my course Profitable Project Plan is that you must set expectations and boundaries around design revisions early on in the client relationship. Beginning with your contract, outline exactly how many rounds of revisions are included in the project, what happens if the client needs additional revisions, and how change orders are managed. Then, throughout the design process, continue to communicate with your client where you’re at and how many revisions they have left. When you provide the initial design concepts, remind the client they have three rounds of revisions available to reach the final design. When you provide the second drafts, remind the client they have two rounds of revisions still available to reach the final design. When you provide the third drafts, let the client know that under your current agreement, this is the last opportunity to provide revisions to reach the final design. Your client isn’t a designer. They didn’t go to design school and earn a degree in graphic design, and they haven’t been working as a designer for years. You need to assume that your client doesn’t know what the phrase round of revisions means. Also, educate your client on the differences between a major (re-layout the entire page) and minor revision (edit this sentence or change this photo) so they understand that not all revisions are created equal. Quick Tip: When a client provides feedback or revisions, don’t make them immediately. First, review their feedback to see if it warrants a conversation about the design, then reply to your client to confirm that this is all of the changes they have for this round of revisions. Often you’ll find that they haven’t yet gathered feedback from all stakeholders, and holding off on making revisions until you have all of the feedback will help reduce the total number of revisions. When I first began freelancing, I would mock up the initial design concepts, send them off to the client, and wait for their feedback. This approach put my clients in an awkward position of providing feedback on the design with absolutely no context, and it created extra work for me to manage all sorts of crazy revision requests, many of which made no sense. Those clients who send you back the “ridiculous revision requests” aren’t wrong — usually they’re just operating with no context, and doing their best to guess at what might work. Share your thought process behind why you chose to do specific things, or why certain elements were designed a certain way. Tie your design decisions to the client’s immediate project goals and long-term business goals. When your client has context for the designs they are reviewing and they understand the design decisions from a business perspective, they are much less likely to second-guess and question the design, which results in fewer revision requests. It’s inevitable that your client is going to make one or two requests that are outside of scope. Don’t make their life difficult by immediately demanding a change order and additional fees. If the request is minor and they’ve been a great client, take care of it for them as a gesture of goodwill. One of the things I like to do is plan for generosity in advance. I include a few hours of “bonus time” in client projects so I have the ability to accommodate an extra client request or revision and happily say yes without it affecting my profit margin. The key is managing the accommodation so it doesn’t lead to expectations of more free work. Too many agencies create a contract, send it to the client, and never ever talk about it again unless there is a problem. This approach turns any reference of your contract into a negative experience and associates the contract problems. Instead, use your contract as a positive client management tool. Reference your contract, terms, and scope of work throughout your project when things are going well so when a project doesn’t encounter a challenge, you can leverage the contract without angering your client. You’re putting the client in control of their website. The client loves you because you gave them exactly what they wanted. Unfortunately, this results in a poor-performing final product and an upset client who is now wondering what went wrong. When your answer is, “I did everything you asked,” you’ve failed to be a designer leader. Your client doesn’t know what they don’t know and what your client wants may not align with what the client needs for the project to be successful. It’s the designer’s job to lead the client through the design process and that means challenging the client when necessary and facilitating critical conversations about the project to protect the integrity of the design strategy. Just remember, approach the client in a friendly, positive helpful way, and not from a place of anger, resentment, or frustration. If a misunderstanding of your client, the scope of work, the goals, or anything else results in the initial design drafts completely missing the mark, don’t get defensive. Take a moment to settle yourself and then work to discover where the communication breakdown happened and what needs to be fixed. Own the mishap do the redesign without using up one of the client’s rounds of revisions. While you can strive to make every client experience an extraordinary one, there are going to be clients that are simply impossible to satisfy and make happy. If your client is out of control, they’re not responding well to your management of their requests and the project, and the situation is causing too much resentment, frustration, and stress, halt the project. Don’t be afraid to put a hard stop on the work and part ways. While it’s common to hear about bad clients, it’s important for designers, agencies, and freelancers of all types to understand that in most “bad client” situations, it’s not the client that’s bad, but the management of the client. Remember, you’re being hired to serve, that’s why it’s called client services. To effectively manage the scope of work and keep design revisions in check, you need to be firm, fair, and friendly in your service and client management and communicate as clearly as possible every step of the way.